"Downtown Character With Uptown Style"
Steps from downtown shopping and the theatre district, this beautifully renovated suite boasts 1300 square feet of elegantly finished open-concept space, complete with elevator access and private parking. High ceilings and massive, architecturally restored windows welcome floods of natural light into the main living area and offer a magnificent view of the downtown streetscape. The fully outfitted kitchen has custom built maple cabinetry and includes dishwasher, microwave, full size refrigerator, and stove. Also includes coffee maker, cutlery, cookware, eating and serving dishes. Linens for bedroom, bath, and kitchen are included. The bedroom has one king-size bed, assuring peaceful sleep, with a Serta's high end Bellezza iSeries mattress. The bedroom also contains a large walk-in dressing area with full-size mirror, 32' flat screen television with satellite tv, and an electric glass stone fireplace that adds to the cozy bedroom ambience. Additional sleeping accommodations are offered in the Brentwood queen size sofa bed pullout, featuring Brentwood's highest quality mattress upgrade. In-Suite Laundry Room, A/C and Wi-Fi. This totally private and beautifully renovated space offers the warmth, comfort, and amenities of home and the convenience and pleasure of Stratford's bustling and friendly downtown community. Check-in time for guests is between 2:00pm - 8:00pm only. Ability to check-in after 8pm cannot be guaranteed. Check-out time for guests is 11:00am. We are a local farmer and his wife, with a heart for the next generation, raising a family in the country way of life. When we came upon 95 Ontario Street, it had been sadly dilapidated by many years of neglect. It was estimated that the third floor had not seen any human activity in nearly 75 years. We saw an opportunity to restore it's integrity and beauty, though the cost and risks were both very high. We made a commitment to take whatever time and expense was necessary, in order to bring the building back to life and it's fullest potential, even though the financial return would not be seen in our lifetime. With no municipal or provincial incentives, funding, or grants, we moved forward with the restoration project. We designed the entire building to be barrier-free, which includes the installation of an elevator. We moved forward with the costly endeavor of removing all asbestos because we didn't want to leave it for the next generation's problem. All windows, door systems, and floors have been replaced, and the entire building has been made energy-efficient, weather tight and insulated to contemporary standards. We have navigated through myriads of Stratford's Heritage approval processes, and upheld and in some cases exceeded, their very high standards. On the Albert Street façade, we have added a Heritage-approved stucco wall system, and on the architecturally significant Ontario Street side, we installed Heritage approved wooden windows that were replicas of the original. We have used exceptional quality materials with high quality installation, and hired all local contractors to do the work. We are confident and full in heart, that the fully restored building that now proudly holds it's place at 95 Ontario Street will not only stand the test of the next one hundred years, but it's walls will provide the warmth of home and the comfort of Stratford's uniquely timeless community, to all who enter. Beautifully renovated! Wide open space! Yet cozy and comfortable! Our usual accommodations in Stratford were not available for our stay and we are glad that they weren't. We happened upon The Suites from the small ad in the Stratford Festival visitors guide. Booking, check-in/out, parking, and additional instructions were all made as easy as possible. Stepping off the elevator into the suite made for an amazing first impression. 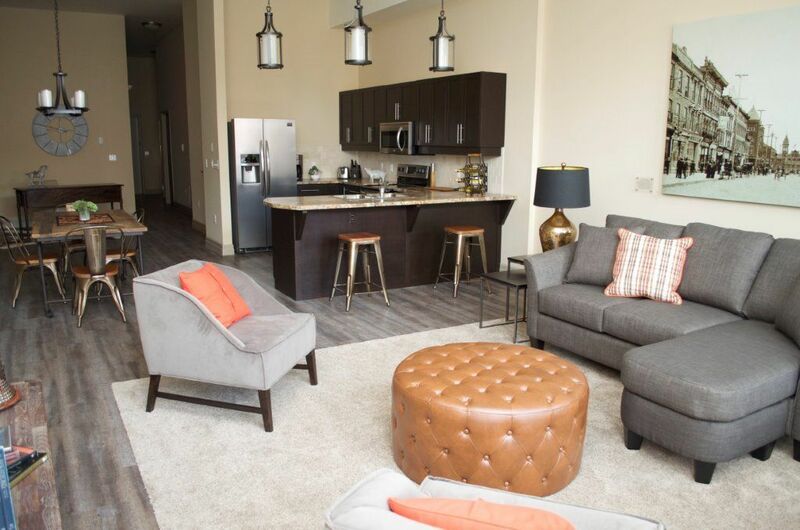 The suite is a beautifully and fully furnished apartment overlooking Ontario Street conveniently located near the theaters, restaurants, and shops. This will now be our first choice when arranging our annual visit to Stratford. Was like being in New York City , or a new Detroit loft! contemporary but comfortable. Extremely clean (even the stairwell and elevator!!!). all necessary amenities. multiple lighting options. enough bath linens "for an army"...and good quality, too. Comfy and smell-good bed linens. Easy access in to condo and out to Stratford offerings. Didn't get to the yogurt shop due to Thanksgiving weekend hours, but that's ok. If anyone needs to sleep on the pullout sofa...bottom half felt somewhat unsupported. one person would sleep diagonally, unless they are closer to 5 feet in height, then shouldnt be a problem. Not sure if 2 people would be "cozy". would rank pullout 3.5 out of 5. However, the king bed was terrific ! The only other bummer might be the noise from next door bar-goers at closing, depending on how many, and how "spirited". Otherwise, the main street/back alley noise wasn't noticeable. WOULD DEFINITELY RETURN TO THIS CONDO!!!! Outstanding suite with all the comforts of home and right in the heart of Stratford. This condo/suite has all that you can want when visiting Stratford. Plenty of space and plenty of amenities with high ceilings, big windows and a giant picture of old Stratford. You are close to everything: shopping, good restaurants and all the theatres. We will be back next year. - Slow Food Sunday Market, 10 a.m. to 2 p.m.
Our Suite accommodates 4 guests comfortably. If your party is larger than four, please contact us to inquire whether or not special arrangements can be made to ensure quality sleep and a pleasurable stay for everyone. If you have failed to inform us of additional guests, we reserve the right to ask your entire party to leave with no refund. Check-in is between 2pm and 8pm only. Check-in after 8pm cannot be guaranteed.